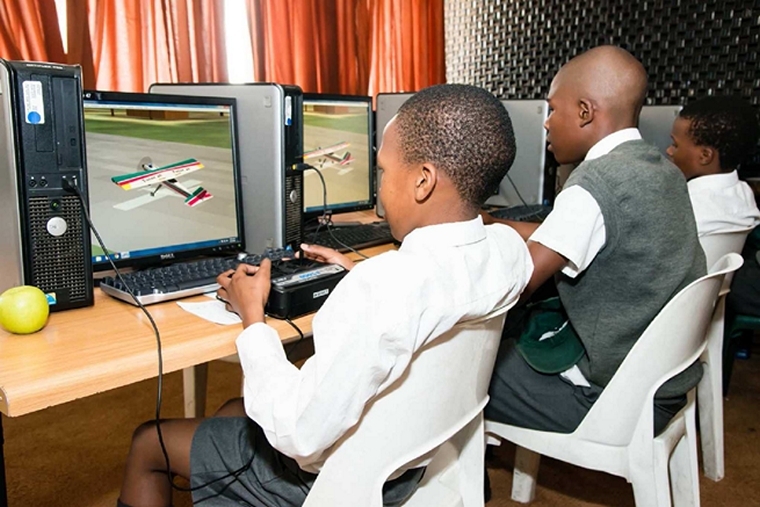 One of the Aero Club's Transformation & Development activities relates to exposing school level children to RC model flying, where the SAMAA and the Aero Club facilitate funds in support of this objective. One of the beneficiary schools is Cornerstone College based in Silverton Pretoria. Cornerstone College is an independent school from Grades R to 12. It has been offering excellent education at an affordable price to township and urban children since it was founded in 1992. Cornerstone has achieved a 100% Matric pass rate for the last 18 years, and a Bachelor's pass rate of around 90% for the last 8 years. 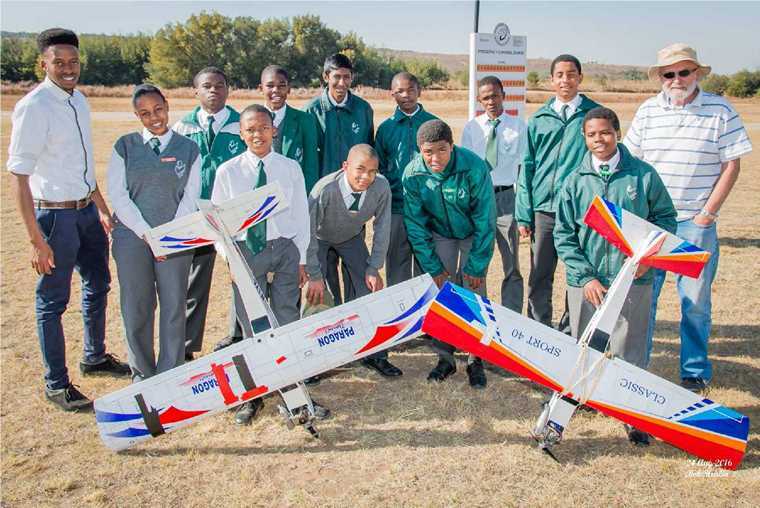 The Cornerstone College Model Flying Club was launched in 2007 at the suggestion of Allen Fraser, Chairman of the Silverton Model Flying Club and owner of Frasers RC Models. Allen proposed a partnership between Cornerstone College, SAMAA, SMFC and Frasers RC Models for the development of young RC pilots. The partnership established by Allen has run successfully since then. The Cornerstone College Model Flying Club is run by the school's director, Rob Hurlin. Rob is a keen aero-modeler and life member of SAMAA and the SMFC. This year (2016) the club membership is 16, which is made up of 2 Grade 7s, 3 Grade 8s, 10 Grade 9s and 1 Grade 10. There are two girls and the rest are boys. It takes at least two years to get members up to the required skill level to attempt the solo exam. 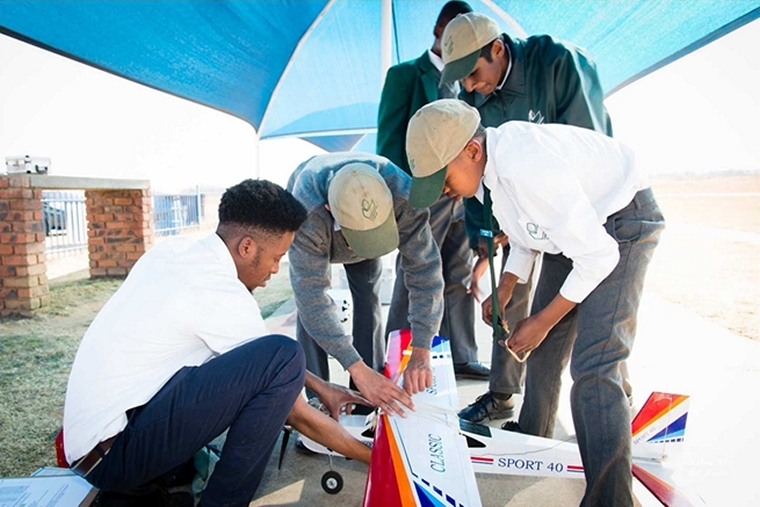 For this reason we prefer students to start with model flying in Grade 7, 8 or 9 so that they have time to reach solo status before reaching Grade 12. Grade 12s have to give up all extra-mural activities to concentrate on their studies, so our club members finish at the end of their Grade 11 year. We usually have one or two club members who are ready to attempt the solo exam each year. This year's young and inexperienced group will need at least another year of training before any of them will be ready for the solo exam. We started the year with three instructors; Rob Hurlin, Andrew Hirst and Gift Kgadima. Andrew is a retired engineer and is well known in RC model flying. 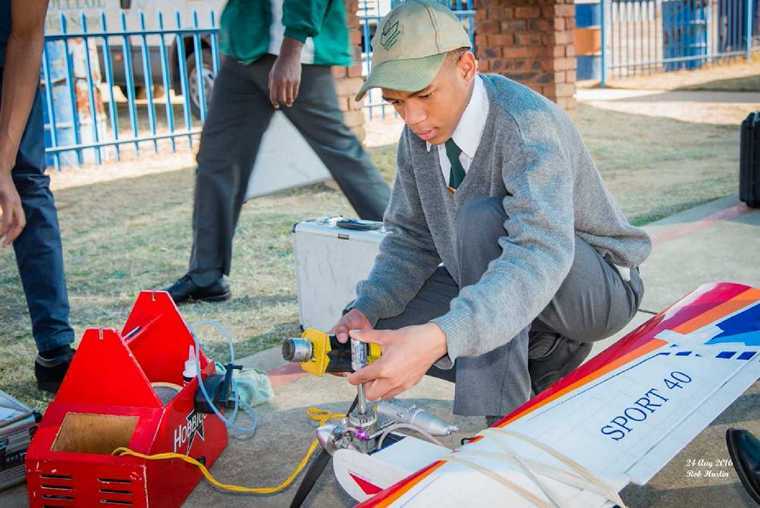 He continues to assist as an instructor, Gift Kgadima matriculated from Cornerstone College in 2011. He is a very talented RC pilot and participated in the national Fun Fly Masters in 2009 (5th place in Sportsman's Class) and 2010 (3rd place in Sportsman's Class). He is also very close to completing his Commercial Pilots License. Gift has been an instructor for the last three years, but stepped down at the end of first term to take up a scholarship with a company flying RC drones commercially. 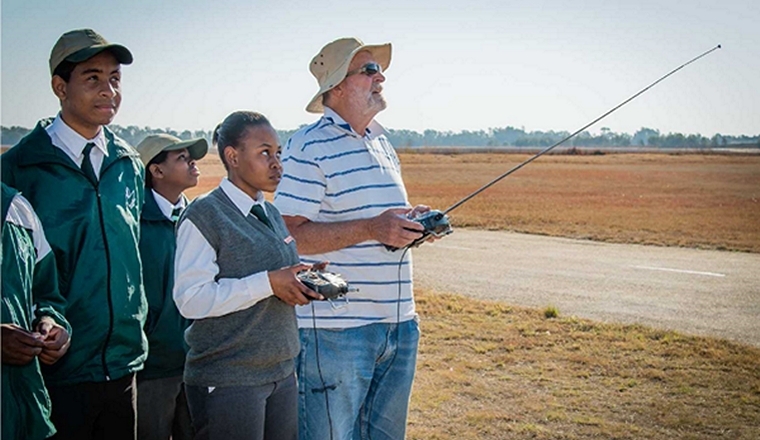 All new club members must achieve at least 80% in two exams before they are permitted to start training with an RC aircraft. The first exam is an identification exam of the most important parts of an R/C aircraft and the Transmitter. The second exam is the knowledge exam and covers the basics of safety, preparation for flying, basic club rules and the care of the aircraft and transmitter. The Cornerstone Model Flying club meets on Wednesday afternoons and also at break time during school on Tuesdays and Thursdays. The first term meetings were used to prepare the members for the exams and to get all the exams written. Once club members have completed their exams, they practice on an FMS simulator on Tuesdays and Thursdays during break time, usually for 15 to 20 minutes per session. Most of the club members had completed their exams and paperwork by the beginning of second term, so flying commenced every Wednesday afternoon at SMFC from 13th April 2016. Progress was slow with only two instructors. Of the 16 club members, between 8 and 12 are able to attend on a Wednesday afternoon due to academic commitments. Each instructor takes 4 to 6 trainees for the afternoon. Each instructor usually manages 3 or 4 flights an afternoon lasting 10 minutes each. This means that each trainee typically gets two sessions of about 5 minutes each to fly the aircraft. This is much less than someone who has their own aircraft and a dedicated instructor! The system we use to grade a club member's progress is to allocate them to a team once they master certain basic maneuvers. They start by learning to make a simple turn. Once they are able to make a turn without spiraling into a dive, they are put in the "D" team. Once they master the level they are on, they graduate to the "C" team where they learn how to fly level figure of 8s. Once this is mastered, they graduate to the "B" team learning take-offs, approaches and circuits, thereafter to the hardest level being the "A" team where it's about learning to land. Once a club member graduates to the "A" team they are taught how to land in various wind conditions. Once they are able to land confidently, they are taught how to make a dead stick landing. They are then coached in everything they need to know to be ready for the SAMAA Solo exam. This year all our club members (excepting one) started without being allocated to a team. By the end of the year there were 4 members who had graduated to the "D" team and two who had graduated to the "C" team. Although development was slow in this year and with a loss of one of our RC aircraft also hampering progress, we look forward to our young member's enthusiasm being channeled into RC flying skills and knowledge as the club continues in 2017 for its 11th year! Many of the club members attended the Africa Aerospace and Defence Air Show on Saturday 17th September 2016 at Waterkloof AFB. They enjoyed it hugely and their horizons were widened considerably!